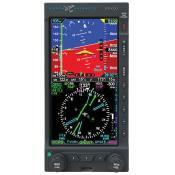 Primary Flight Display **From $8,595 installed. **Unit Price $5,995. From $8,595 installed. This unit must be installed by Pacific Coast Avionics. The EFD1000 Pilot PFD is a big step up "in features, reliability, accuracy and safety" from the analog gauges it's designed to replace. Yet it costs little more than overhauling those two primary instruments. Your GPS flight plan legs and waypoints can be shown right on top of your compass rose. So you can see at a glance where you are relative to your course, making it a breeze to follow your VFR GPS flight plan. And the picture is right in front of you, on a bright, color display that's higher-resolution, and probably larger, than your GPS over in the center stack. The built-in air data computer shows you wind speed and direction at all times, with an arrow to help you visualize the winds aloft. And knowing your indicated airspeed, altitude and outside air temperature, the air data computer (ADC) constantly displays your true airspeed (TAS). If you're flying with an ordinary Directional Gyro (DG) today, you'll love never again having to set your DG to your whiskey compass. And the heading bug makes it easy to fly your wind-corrected heading to hold course. The built-in altitude alerter lets you set your target altitudes for climbs and descents, alerting you to when it's time to level off, and again if you drift too far from the altitude you are holding. 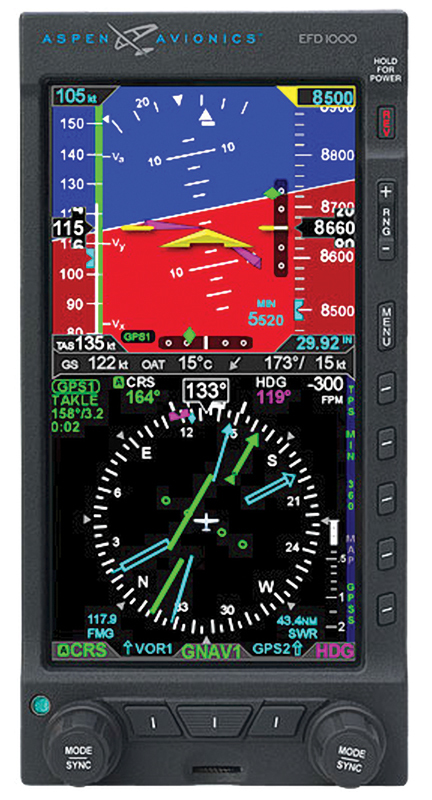 A built-in battery backup, and emergency VFR GPS navigator, will keep all your critical instruments working, even in the event of a vacuum pump or total electrical system failure, when everything else in your cockpit goes dark. 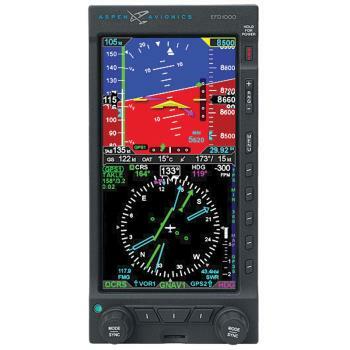 With all these and many other features, the EFD1000 Pilot PFD takes you far beyond your old analog gauges, and makes your flying easier and safer, at a price that's easy to afford. And when your flying evolves to need serious IFR instrumentation, a simple and cost-effective software upgrade can turn your Pilot into a Pro, protecting your original investment. The Evolution flight displays are an innovative, patent pending modular system that slides into the existing 3-inch instrument holes in any instrument panel. A universal bracket provides easy surface mounting using existing instrument cutouts, plus the system can optionally be flush mounted if desired. Evolution EFD installation is so simple that installation time and cost are cut at least in half. The modular EFD platform allows for easy expansion with additional capabilities, redundancy, and display area. The interactive modules mount side-by-side in one, two, and three tube configurations for supreme flexibility and upgradability.